Why use the same contact lens everyday for more than a dollar a day, when you can have a choice of 6 different brands of single use lenses that are cleaner and healthier for your eyes, for less than a dollar a day. Ask your eyecare professional about single use contact lens choices that are avilable to fit your individual needs. Contact lenses for every eye - rigid and soft bifocals, disposables and specialty products avialable. Cooper: Biofinity sphere, toric and multi monthly replacement lenses as well as aspheric lenses. Northeastern Eye Institute also offers the Proclear sphere, toric, and multi monthly replacement lenses for dry eyes as well as the Proclear daily disposable lenses by Cooper Vision. ACUVUE®: OASYS® sphere, toric and multi 2-week replacement lenses for dry eyes as well as a recently released daily disposable. 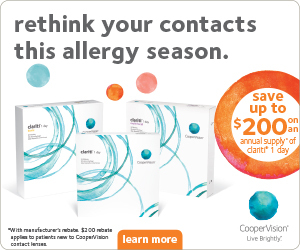 Northeastern Eye Institute also offers the ACUVUE® MOIST® and 1-Day ACUVUE® TruEye® daily disposable lenses. B&L: Purevision sphere, Toric, multi and glare monthly replacement lenses approved for 30 day continuous wear as well as aspheric lenses for night time driving. Northeastern eye Institute also offers the B&L Biotrue daily disposable lenses. Alcon Air Optix: Sphere, toric and multi monthly replacement lenses that are approved for extended wear. Northeastern Eye Institute also offers the AirOptix colors which is a monthly disposable to change the color of your eyes. Daily disposables contact lenses from Northeastern Eye Institute are ideal for those suffering from allergies and are very convenient for sports wear and social wear. Daily disposables are very healthy for your eyes since you do not have to sleep with them, store them, clean them or disinfect them. The Contact Lens Department at Northeastern Eye Institute has been selected to participate in several FDA studies and manufacturer-sponsored research projects. This is in recognition of the thorough process, safety measures, and methodical approach utilized by Northeastern Eye Institute towards its care of eyewear patients and their needs. The Contact Lens Department is also involved in a National Institutes of Health (NIH)-funded research project to study the natural history of a corneal disease called keratoconus. This disease generally requires contact lens use. Northeastern Eye Institute was the only private center to be selected for the study. To learn more about the latest in contact lenses products and services that we offer at Northeastern Eye Institute in Pennsylvania, please contact our office today to schedule your initial appointment. You may call our main office at (570) 342-3145 or800-334-2233 to schedule your appointment.